M Barnwell Services are the largest independent manufacturer, stockist and distributor of fluid sealing products in the UK. We stock and supply a range of Aflas® Seals (TFE/P) that are designed for many applications in industries such as Aerospace and Defence, Chemical, General Industrial Environments, and Offshore Drilling. We provide the most diverse material options in the market and can supply Aflas® Seals (TFE/P) in many sizes for specialty performance. Combine that with our team of experts and we will offer you the right seal for your application. 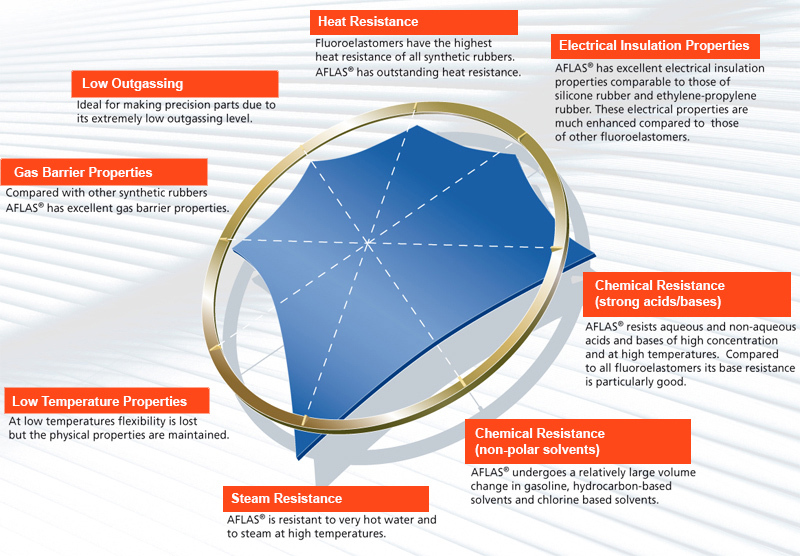 Aflas® is a form of Fluoroelastomer (copolymer of Tetrafluoroethylene-Propylene), which is known for its great overall resistance to a wide range of chemicals including alkalis, amines, methanol, acid, and steam. It’s the material of choice for products and systems that need to operate in rather rough conditions. Therefore, they are used worldwide in all sorts of industrial applications where utmost reliability is demanded, along with the elastic features of synthetic rubber. It is established on an alternating copolymer of tetrafluoroethylene and propylene. AFLAS® 600X (development grade) – with new ‘rapid cure’ technology. Eminent tear strength, compression set, and superior mould release. Perfect for high temperature (HPHT) and high-pressure applications in rough environments where 25 years of service life is demanded. Suitable for compression moulding. If you would like more information about our range, download our catalogue, visit the Seal Maker Page or contact a member of the team. Mechanical Properties: Excellent permeation resistance, Good wear resistance, Moderate compression set resistance, Moderate short-term resilience, Eminent electrical insulation features with a volume resistivity of 1016 Ω·cm. Recommended for: Di-ester lubricants, Vacuum, Steam, Most acids/solvents, Petroleum oils/fuels, Amines (ammonia), Halogenated hydrocarbons, Bases. Not Recommended for: Low molecular esters and ethers, Ketones (MEK), Auto-aircraft brake fluids, Acetone, Skydrol, Ethyl acetate.